Pausing in front of the old San Gabriel Mission, Pacific Electric no. 023 and several PE tour guides smile for the camera, attributed to Charles Lawrence, PE’s official photographer. 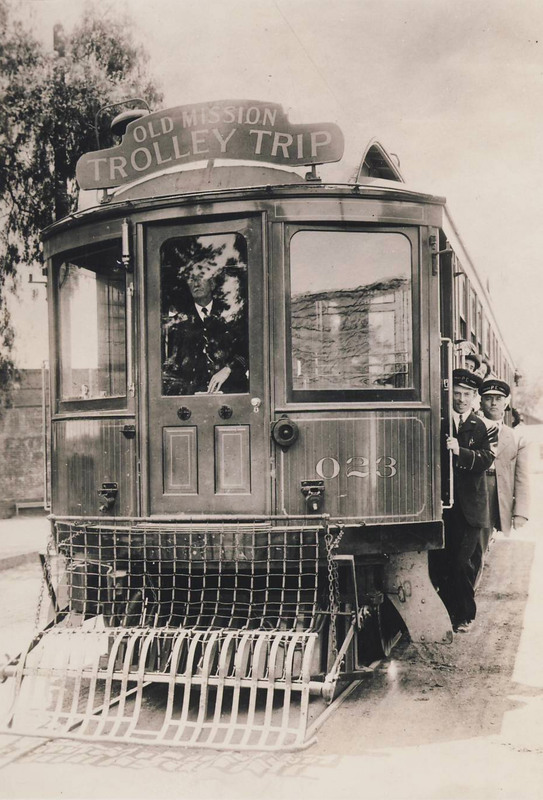 While the Old Mission Trolley Trip was well attended, there were two others that also were well noted; the Orange Empire Trolley Trip and the Mount Lowe Trolley Trip. One reason the Mission trip was unique was the the constant performances of the “Mission Play” by John Steven McGroarty, featuring Frederick Warde and “a cast of over 100 players” every afternoon, evenings (Wednesday and Saturday). Among the other mentions in the mission area were “The old Grape Vine” and the “Spanish Eating House” all within a few steps of the PE stop. Car 023 would become the 996 in 1927 and was one of 19, 950’s that were scrapped in late 1940. 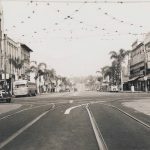 Had it lasted until Dec.7.1941, the 996 might have been rebuilt for badly needed War time service, and lasted until the end of the Venice Short Line.